Lanosterol 14α-demethylase (CYP51A1) is a cytochrome P450 enzyme that is involved in the conversion of lanosterol to 4,4-dimethylcholesta-8(9),14,24-trien-3β-ol. The cytochrome P450 isoenzymes are a conserved group of proteins that serve as key players in the metabolism of organic substances and the biosynthesis of important steroids, lipids, and vitamins in eukaryotes. As a member of this family, lanosterol 14α-demethylase is responsible for an essential step in the biosynthesis of sterols. In particular, this protein catalyzes the removal of the C-14α-methyl group from lanosterol. This demethylation step is regarded as the initial checkpoint in the transformation of lanosterol to other sterols that are widely used within the cell. Although lanosterol 14α-demethylase is present in a wide variety of organisms, this enzyme is studied primarily in the context of fungi, where it plays an essential role in mediating membrane permeability. In fungi, CYP51 catalyzes the demethylation of lanosterol to create an important precursor that is eventually converted into ergosterol. This steroid then makes its way throughout the cell, where it alters the permeability and rigidity of plasma membranes much as cholesterol does in animals. Because ergosterol constitutes a fundamental component of fungal membranes, many antifungal medications have been developed to inhibit 14α-demethylase activity and prevent the production of this key compound. The structural and functional properties of the cytochrome P450 superfamily have been subject to extensive diversification over the course of evolution. Recent estimates indicate that there are currently 10 classes and 267 families of CYP proteins. It is believed that 14α-demethylase or CYP51 diverged early in the cytochrome's evolutionary history and has preserved its function ever since; namely, the removal of the 14α-methyl group from sterol substrates. Although CYP51's mode of action has been well conserved, the protein's sequence varies considerably between biological kingdoms. CYP51 sequence comparisons between kingdoms reveal only a 22-30% similarity in amino acid composition. Structure of lanosterol 14α-demethylase (CYP51), as identified by Podust et al. Although the structure of 14α-demethylase may vary substantially from one organism to the next, sequence alignment analysis reveals that there are six regions in the protein that are highly conserved in eukaryotes. These include residues in the B' helix, B'/C loop, C helix, I helix, K/β1-4 loop, and β-strand 1-4 that are responsible for forming the surface of the substrate binding cavity. 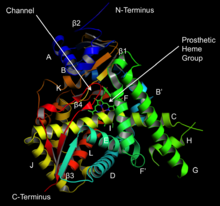 Homology modeling reveals that substrates migrate from the surface of the protein to the enzyme's buried active site through a channel that is formed in part by the A' alpha helix and the β4 loop. Finally, the active site contains a heme prosthetic group in which the iron is tethered to a thiolate ligand on a conserved cysteine residue. This group also binds diatomic oxygen at the sixth coordination site, which is eventually incorporated onto the substrate. Three-step demethylation of lanosterol, mediated by lanosterol 14α-demethylase. The enzyme-catalyzed demethylation of lanosterol is believed to occur in three steps, each of which requires one molecule of diatomic oxygen and one molecule of NADPH (or some other reducing equivalent). During the first two steps, the 14α-methyl group undergoes typical cytochrome monooxygenation in which one oxygen atom is incorporated by the substrate and the other is reduced to water, resulting in the sterol's conversion to a carboxyalcohol and then a carboxyaldehyde. The aldehyde then departs as formic acid and a double bond is simultaneously introduced to yield the demethylated product. The biological role of this protein is also well understood. The demethylated products of the CYP51 reaction are vital intermediates in pathways leading to the formation of cholesterol in humans, ergosterol in fungi, and other types of sterols in plants. These sterols localize to the plasma membrane of cells, where they play an important structural role in the regulation of membrane fluidity and permeability and also influence the activity of enzymes, ion channels, and other cell components that are embedded within. With the proliferation of immuno-suppressive diseases such as HIV/AIDS and cancer, patients have become increasingly vulnerable to opportunistic fungal infections (Richardson et al.). Seeking new means to treat such infections, drug researchers have begun targeting the 14α-demethylase enzyme in fungi; destroying the fungal cell's ability to produce ergosterol causes a disruption of the plasma membrane, thereby resulting in cellular leakage and ultimately the death of the pathogen (DrugBank). Azoles are currently the most popular class of antifungals used in both agricultural and medical settings. These compounds bind as the sixth ligand to the heme group in CYP51, thereby altering the structure of the active site and acting as noncompetitive inhibitors. The effectiveness of imidazoles and triazoles (common azole subclasses) as inhibitors of 14α-demethylase have been confirmed through several experiments. Some studies test for changes in the production of important downstream ergosterol intermediates in the presence of these compounds. Other studies employ spectrophotometry to quantify azole-CYP51 interactions. Coordination of azoles to the prosthetic heme group in the enzyme's active site causes a characteristic shift in CYP51 absorbance, creating what is commonly referred to as a type II difference spectrum. Prolonged use of azoles as antifungals has resulted in the emergence of drug resistance among certain fungal strains. Mutations in the coding region of CYP51 genes, overexpression of CYP51, and overexpression of membrane efflux transporters can all lead to resistance to these antifungals. Consequently, the focus of azole research is beginning to shift towards identifying new ways to circumvent this major obstacle. ^ "Metabocard for 4,4-Dimethylcholesta-8,14,24-trienol (HMDB01023)". Human Metabolome Database. February 2014. ^ a b c d Lepesheva GI, Waterman MR (March 2007). "Sterol 14alpha-demethylase cytochrome P450 (CYP51), a P450 in all biological kingdoms". Biochimica et Biophysica Acta. 1770 (3): 467–77. doi:10.1016/j.bbagen.2006.07.018. PMC 2324071. PMID 16963187. ^ a b Daum G, Lees ND, Bard M, Dickson R (December 1998). "Biochemistry, cell biology and molecular biology of lipids of Saccharomyces cerevisiae". Yeast. 14 (16): 1471–510. doi:10.1002/(SICI)1097-0061(199812)14:16<1471::AID-YEA353>3.0.CO;2-Y. PMID 9885152. ^ a b c d e f g h i Becher R, Wirsel SG (August 2012). "Fungal cytochrome P450 sterol 14α-demethylase (CYP51) and azole resistance in plant and human pathogens". Applied Microbiology and Biotechnology. 95 (4): 825–40. doi:10.1007/s00253-012-4195-9. PMID 22684327. ^ Hannemann F, Bichet A, Ewen KM, Bernhardt R (March 2007). "Cytochrome P450 systems--biological variations of electron transport chains". Biochimica et Biophysica Acta. 1770 (3): 330–44. doi:10.1016/j.bbagen.2006.07.017. PMID 16978787. ^ Lepesheva GI, Waterman MR (February 2004). "CYP51--the omnipotent P450". Molecular and Cellular Endocrinology. 215 (1–2): 165–70. doi:10.1016/j.mce.2003.11.016. PMID 15026190. ^ a b c d e f g Lepesheva GI, Waterman MR (January 2011). "Structural basis for conservation in the CYP51 family". Biochimica et Biophysica Acta. 1814 (1): 88–93. doi:10.1016/j.bbapap.2010.06.006. PMC 2962772. PMID 20547249. ^ Hargrove TY, Wawrzak Z, Liu J, Nes WD, Waterman MR, Lepesheva GI (July 2011). "Substrate preferences and catalytic parameters determined by structural characteristics of sterol 14alpha-demethylase (CYP51) from Leishmania infantum". The Journal of Biological Chemistry. 286 (30): 26838–48. doi:10.1074/jbc.M111.237099. PMC 3143644. PMID 21632531. ^ Podust LM, von Kries JP, Eddine AN, Kim Y, Yermalitskaya LV, Kuehne R, et al. (November 2007). "Small-molecule scaffolds for CYP51 inhibitors identified by high-throughput screening and defined by X-ray crystallography". Antimicrobial Agents and Chemotherapy. 51 (11): 3915–23. doi:10.1128/AAC.00311-07. PMC 2151439. PMID 17846131. ^ Vanden Bossche H, Koymans L (1998). "Cytochromes P450 in fungi". Mycoses. 41 Suppl 1: 32–8. PMID 9717384. ^ Abe F, Usui K, Hiraki T (September 2009). "Fluconazole modulates membrane rigidity, heterogeneity, and water penetration into the plasma membrane in Saccharomyces cerevisiae". Biochemistry. 48 (36): 8494–504. doi:10.1021/bi900578y. PMID 19670905. ^ Mullins JG, Parker JE, Cools HJ, Togawa RC, Lucas JA, Fraaije BA, Kelly DE, Kelly SL (2011). "Molecular modelling of the emergence of azole resistance in Mycosphaerella graminicola". PLOS One. 6 (6): e20973. Bibcode:2011PLoSO...620973M. doi:10.1371/journal.pone.0020973. PMC 3124474. PMID 21738598. ^ Tuck SF, Patel H, Safi E, Robinson CH (June 1991). "Lanosterol 14 alpha-demethylase (P45014DM): effects of P45014DM inhibitors on sterol biosynthesis downstream of lanosterol". Journal of Lipid Research. 32 (6): 893–902. PMID 1940622. ^ Vanden Bossche H, Marichal P, Gorrens J, Bellens D, Verhoeven H, Coene MC, Lauwers W, Janssen PA (1987). "Interaction of azole derivatives with cytochrome P-450 isozymes in yeast, fungi, plants and mammalian cells". Pesticide Science. 21 (4): 289–306. doi:10.1002/ps.2780210406. ^ Yoshida Y, Aoyama Y (January 1987). "Interaction of azole antifungal agents with cytochrome P-45014DM purified from Saccharomyces cerevisiae microsomes". Biochemical Pharmacology. 36 (2): 229–35. PMID 3545213. ^ Vanden Bossche H, Dromer F, Improvisi I, Lozano-Chiu M, Rex JH, Sanglard D (1998). "Antifungal drug resistance in pathogenic fungi". Medical Mycology. 36 Suppl 1: 119–28. PMID 9988500. ^ Leroux P, Albertini C, Gautier A, Gredt M, Walker AS (July 2007). "Mutations in the CYP51 gene correlated with changes in sensitivity to sterol 14 alpha-demethylation inhibitors in field isolates of Mycosphaerella graminicola". Pest Management Science. 63 (7): 688–98. doi:10.1002/ps.1390. PMID 17511023. ^ Sanglard D, Ischer F, Koymans L, Bille J (February 1998). "Amino acid substitutions in the cytochrome P-450 lanosterol 14alpha-demethylase (CYP51A1) from azole-resistant Candida albicans clinical isolates contribute to resistance to azole antifungal agents". Antimicrobial Agents and Chemotherapy. 42 (2): 241–53. PMC 105395. PMID 9527767. ^ Cannon RD, Lamping E, Holmes AR, Niimi K, Baret PV, Keniya MV, Tanabe K, Niimi M, Goffeau A, Monk BC (April 2009). "Efflux-mediated antifungal drug resistance". Clinical Microbiology Reviews. 22 (2): 291–321, Table of Contents. doi:10.1128/CMR.00051-08. PMC 2668233. PMID 19366916.